Tobacco flea beetles (Epitrix hiritipennis) are the most common species of flea beetles found in North Carolina tobacco. 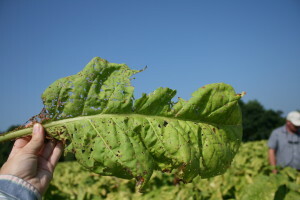 Other species of flea beetles may also feed on tobacco, but all species have similar biology and are managed in the same way. Tobacco flea beetles complete 3 to 4 generations per year in the southeast, depending on weather, and the generation time is roughly 30 days. Adult flea beetles overwinter in plant matter surrounding fields and migrate into crop plantings in the spring. Tobacco flea beetle eggs are extremely small and are laid in soil cracks around the base of host plants. Larvae feed on the roots of tobacco and other solenaceous plants. The effect of larval feeding on tobacco plants is unclear. 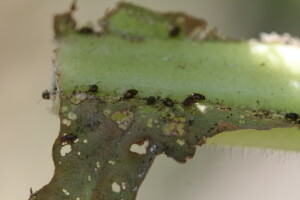 Adult tobacco flea beetles feed on foliage, resulting in small, shot holes on leaf surfaces. This defoliation can stunt young plants. Grower concern about late season flea beetle damage has been rising, particularly because of potential impacts on leaf quality. As farm size has increased, tobacco is held in the field for a longer time and exposed to flea beetle feeding for a longer period. The relationship between beetle injury and cured leaf weight and quality is unclear but is being studied. Treatment is justified in the early summer when small plants average 4 or more beetles per plant. However, virtually all conventionally grown tobacco in North Carolina is treated with a systemic neonicotiniod insecticide in the greenhouse, or less often, at transplant. These materials provide long term control of flea beetles, typically through topping. Systemic treatments are attractive because of their ease and efficacy, but they also are not always needed. Flea beetles are not economically significant in every field every year, and systemic treatments may results in more insecticide being used than necessary. Treatment for large plants is recommended when there are 60 or more beetles per plant or when the lower leaves begin to look ragged or lacy at the base (near the stalk). The threshold for large plants is not firm, as fields with fewer than 60 beetles per plant have been observed to have significant feeding injury. Late season flea beetles can be difficult to control because they are localized on the lower parts of the plant. Therefore, lower stalk coverage is essential. Limited bioassays conducted in 2010 suggest that materials registered for foliar application in tobacco against flea beetles are efficacious. See the North Carolina Agricultural Chemicals Manual for registered materials and use recommendations. There are no commercially available biological control agents for use against tobacco flea beetles. Observations in 2010 suggest that organic fields may have less late season flea beetle injury than conventional fields.